On your last working day, before you are relieved of your services, do remember to write a Last Working Day Mail thanking your organisation for the opportunities and great memories. In your last working day mail, thank your manager, colleagues and peers for their support and also the organisation at large. If you have served a notice period after putting your resignation mail make sure that you have completed all your resignation formalities and delegated your work. In your Last Day Thank You Mail, if you wish, you may explain your decision in case you are resigning due to personal reasons. 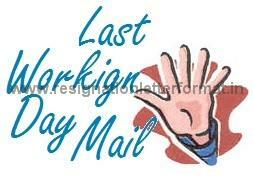 Following is a sample Last Working Day Mail format for someone who is resigning due to personal reasons. Finally the day has come... My last working day at our Organisation!! Having spent 3.1 years here, today my heart has mixed feelings and emotions as I look down upon memory lane of my journey with the Organisation. The day I entered this company's training center, is still as fresh as the lush green beauty of the campus. Nervous, excited, happy, all set to begin this memorable journey, I have lived and enjoyed each and every bit of my time with with the organization. I am thankful to the organisation for providing me with great learning opportunities and my trainers for supporting me during me training days. Each and every moment was full of life!! I would like to thank my friends in Pune: Ryan, Vishal, Neha, Venkat and Sam. We have had awesome fun and have been through all ups and downs of life with each other. Will miss you guys the most.. I would like to thank my manager Dave and all my team mates who have been a great support and helped me grow professionally. I had a nice time with you guys. Special thanks to Williams. It was really a pleasure working with him. The <Organisation> will always hold a very special place in my heart. It has always been my dream company and I feel honored to have been associated with it. I will miss every bit of the time I spent here from the bottom of my heart. I wish all the best to all of you for your future endeavors Thank you all for being there and making my journey a memorable one. I have had the time of my life here!! You resignation letter and last workingday mail will be your final communication with the organisation. It’s always good to leave on good terms. Use this site extensively to frame your resignation letter and thank you letter. Check out Funniest Resignation Letter Ever!